YouTube is a fantastic resource, and the reason I’m bringing this up is because me, my friends, my staff, my team, we all forget this. I bet you do too. When you want to know how to do something at work, no matter what it is, have you ever looked it up on YouTube? Now, you might have googled it. You might ask your friends. You might pay to be a member of Linda.com, get all the instructions, but I can’t think of the last time I looked for something on YouTube and could not find it. For example, how to set up a WordPress blog. Google it. There are umpteen hundred, thousand results, and they’ll be current, so if you’ve got one that’s out of date, look at another one. It’s free my friends. That’s the beauty. People will specialize, so then, you find a little detail in that setup of WordPress Blog that you’re not quite sure about. Search that on YouTube. 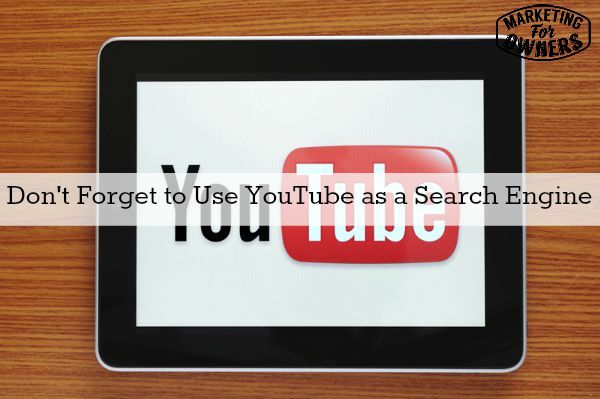 YouTube is owned by Google, but YouTube has its own search engine, and it is the second largest, most popular search engine in the online world. It works brilliantly. Try it. It’s not just for looking up song lyrics. So, if you need to do something at work, do something in an Excel Spreadsheet, on a Google doc, upload to Dropbox, configure,etc — you can do it through YouTube. If you search for it in YouTube, you will find it, and if you don’t, just change the search terms a little and look a little bit harder. It’s there. It’s a free resource. It’s amazing! Some of the people put stuff up there that’s incredibly professional. Honestly, the amount of things I’ve learned that I have not even realized the information was there. It’s amazing! But, it’s not just how to do things. For example, if you are in marketing like me, I can look up How to write a sales letter, how to write a long-form sales letter, how to write a short-form sales letter. The information will be there, and someone will give you examples of how they do it. Think of anything, referrals in our system, the last step, the fifth P in our perpetual sales cycle, it’s referrals that we’re looking for. Look up “How to get referrals.” Now again, when it comes in a video format, it’s quite often easier to digest because generally, the good videos are two minutes long, and very, very short. I’m looking at this. We’re right at four. Sorry. But they’re short. The thing that I think people forget is that every single thing can be found on YouTube. Someone earlier asked me, they were listening to a video and they couldn’t figure out how to do something with it. Fortunately, I happen to know but you can YouTube it. So, in your marketing, if you want to know examples of great adverts, examples of great Facebook ads, examples of great ad work copy, look them up on YouTube. People will show you how to do them. Just about the most popular term on YouTube is “How to”. You’ll be amazed. Now, on the other side, in your business, have you put up a video about that? What do you do? Are you a painter and decorator? For instance, how do you get a straight line? How do you keep the paint off the glass when painting a window frame? Do you think people wouldn’t want to know? They certainly do. I’m sure of this. You’re going to say, “Oh, there’s bound to be a video already” But is there one from you? Make it for YouTube and then embed it on your website, on your blog, again, building your expertise, doing series of simple tips on how to paint around the house without making a mess. Great, eh? So work on it, and try it with your staff. Remind your staff it’s there. Today is the time for a drive time podcast. I was actually listening to this on the way down to the duck pond here on a short drive and I have to say, I’m impressed. I’ve been impressed before with this one, but he’s good. 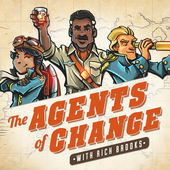 The Podcast I am talking about today is Agents of Change hosted by Rich Brooks. Now, he also has a conference. He’s based in Portland, Maine, and he holds a conference once a year, the “Agents of Change” conference. I’ve not been. I believe it’s very good and I believe Portland in Maine is a fantastic place to be. But he covers all things online, so he will cover marketing, websites, SEO advertising, things like that. But Rich sounds like a lovely bloke. The thing I like is he interviews people. He sounds like just an ordinary guy. He sounds genuine, believable, no hype, no pressure, no nothing. When he interviews people, he just has a nice chit chat with them but he gets great information, so that is worth it. Go to iTunes, look up Agents of Change podcast. It will come up. It came up first when I tried that search and he then has a whole website linked off it. And by the way, when you have listened to his podcast, if you agree with me that it’s great, give him a rating and a review because that’s what powers these things. I would appreciate one too, whether it’s on Stitcher, whether it’s on iTunes, whether it’s on Soundcloud, just tell me what you think if you think there’s room for improvement, let me know. I will try my best. I like to please. But ratings and reviews count for everything. What are you going to search for on youtube?